But Philby was secretly betraying his friend. 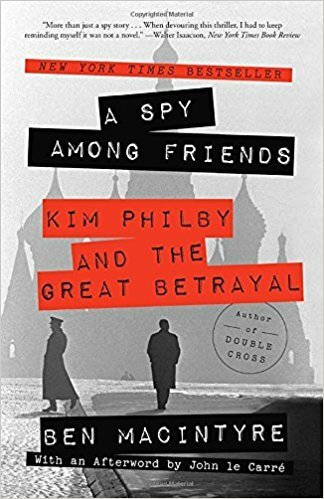 Every word Elliott breathed to Philby was transmitted back to Moscow—and not just Elliott’s words, for in America, Philby had made another powerful friend: James Jesus Angleton, the crafty, paranoid head of CIA counterintelligence. Angleton’s and Elliott’s unwitting disclosures helped Philby sink almost every important Anglo-American spy operation for twenty years, leading countless operatives to their doom. Even as the web of suspicion closed around him, and Philby was driven to greater lies to protect his cover, his two friends never abandoned him—until it was too late. The stunning truth of his betrayal would have devastating consequences on the two men who thought they knew him best, and on the intelligence services he left crippled in his wake. I knew very little about the British spies during World War II and after, but A Spy Among Friends taught me a lot about them. This story focused on more than just the spy industry, but also the Russians and how they were infiltrating so many places to find other countries secrets. This story was a slower read, but it was still very interesting and worth reading if you like spies and interesting history reads.